Exo Roast Co. is just northeast of the city centre, a five-minute walk under the railway from the Amtrak station. Part of the Historic Fourth Avenue District, it’s actually on 6th Avenue, while the bulk of the tall, single-storey brick-built building runs alongside 7th Street, with only the (comparatively) narrow storefront on 6th Avenue itself. Although long and thin, it’s actually quite wide and almost as tall, open to the box rafters of the roof high above. Almost the entire front is glass, where central double doors lead in from 6th Avenue, flanked by a bench on each side. There’s some bike-parking, sheltered under a large tree, while around the corner on 7th Avenue, there’s more outside seating, installed since my visit last year. Inside a pair of two-person tables flank the door. The counter, on the right, runs to the back of the (front) room, the rear half housing the Probat roaster. The pour-over faces the front, with the cake in a glorious old display case on the corner, followed, along the long side of the counter, by the till, grinders, green La Marzocco Strada espresso machine and take-away station/collection area. On the left, another door opens onto 7th Street, followed by a long bench under a set of retail shelves, then a row of five two-person tables. The first two are wide, but the rest are narrow and close together, with the chair from one table banging into the chair at the next. These last three tables are opposite the roastery, where there’s a narrow four-person bar providing a glorious view of the roaster. Finally, at the far end of the roastery, a broad, two-person table faces front. Right at the back on the left, a doorway leads to a small lobby, with its own door on the left opening onto 7th Street. 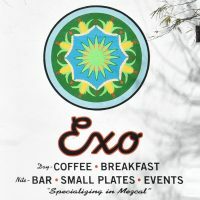 If you keep going, you’ll come into the rear section of Exo, which provides overspill seating during the day and from 18:00 – 23:00 on Thursday, Friday and Saturday, is run as a bar which serves small plates. It also functions as an occasional events space, which was the case during my visits, so I wasn’t able to get any photographs. When it comes to coffee, it’s all roasted on the Probat, Exo only serving single-origins which change every week or s. During my visit last year, there was a Guatemalan on espresso, a Peruvian on batch-brew and two more on pour-over via (the same Guatemalan and an Ethiopian). The barista recommended the Guatemalan in milk, so I had a cortado, followed by the same coffee as a pour-over to compare. As a cortado, the milk and coffee combinws to produce something reminiscent of a biscuit flavour, but with more fruity overtones, while as a pour-over, it lacked the funkiness of the espresso, but that’s no bad thing. Served in a single, large mug, it was a smooth, mellow coffee, the sort you could drink all day. I made it just in time for breakfast, having got to Exo at 11.57. I selected the breakfast tacos (this is the south-west after all) which was an inspired choice. Two tacos, each over-stuffed with a fried egg, roasted winter vegetables, goat’s cheese, pickled onion strips and chilli oil. I was a little sceptical of the ingredient list, but on the plate, it was a delight, albeit a messy one (although that could have been me, rolling up the tacos and eating them by hand). The roasted winter vegetables were heavy on potatoes, which is fine by me, since I love potatoes, and the combination of flavours and textures was awesome. On my return this year, I had a Burundi single-origin espresso which was excellent, a rich, complex coffee. I’d hoped to try the small plates in the evening, but there was an event on, so the kitchen was closed. You can also see what local coffee-blogger, Coffee Ken, made of Exo Roast Co. This entry was posted in Breakfast, Cafe/Roaster, Cafes, Cake, Coffee & Wine, Dinner, Evening Opening, Laptop Friendly, Late Opening, Retailers, Roastery, Stations Nearby, Tucson and tagged Exo, include, USA2019-01 by Brian Williams. Bookmark the permalink.